Bradford City once again upset all the odds last night as they pulled off a spectacular 3-1 victory in their League Cup semi final first leg tie against Aston Villa. 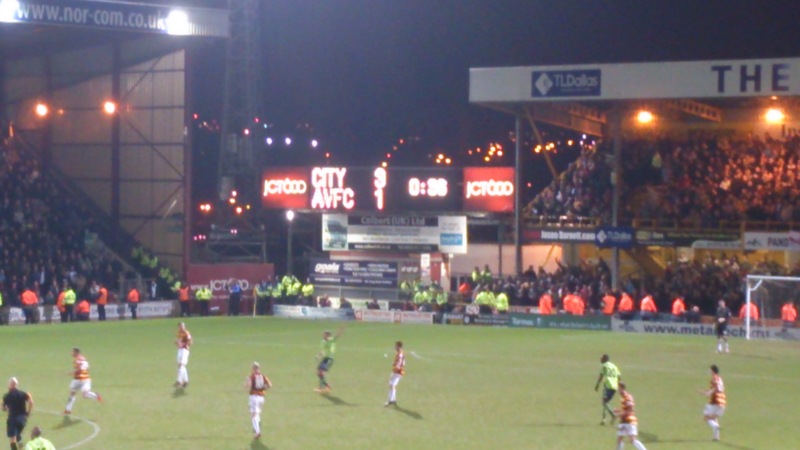 There was an electric atmosphere around Valley Parade similar to that against Arsenal as the fans sang their hearts out in support of the players. Another heroic performance from Phil Parkinson’s men saw the Yorkshire side score three times against Premier League opposition to set up a tantalising second leg in Birmingham. Bradford managed to weather the early storm after a promising start by Villa as Matt Duke showed exceptional form to deny Christian Benteke and Gabby Agbonlahor. Bradford, lead by the talismanic Gary Jones, managed to fight their way back into the game, showing desire and determination. The pacey, Bermudan forward, Nahki Wells opened the scoring for Bradford on 19 minutes after Zavon Hines’ deflected effort fell kindly into his path. The 22-year-old provided a composed finish into the bottom right hand corner of Shay Given’s goal. Bradford took the 1-0 advantage going into the half time interval. Villa boss Paul Lambert clearly vented his frustration to his team at half time as the Midlands side flew out of the traps at the start of the second half. However, it was a resilient Bradford who took the initiative and doubled their lead as Rory McArdle attacked Gary Jones’ cross to head home a powerful effort from close range. Minutes later, James Hanson almost put The Bantams 3-0 up as his header crashed off the cross bar. Paul Lambert made one attacking change in the second half as Darren Bent replaced Gabby Agbonlahor on 55 minutes. The England forward cut a very dejected figure up front for Villa and this was only exacerbated when he missed a guilt-edged opportunity ten minutes after his introduction. Chalres N’Zogbia’s effort was spilled by Matt Duke but Bents follow up header somehow found its way over the cross bar. Bent lasted less than half an hour before he had to be subbed off, seemingly succumbing to an injury. Andreas Wiemann managed to capitalise on a rare defensive error by Bradford when Carl McHugh failed to deal with Christian Benteke’s headed flick on. The Austrian nipped in behind the centre back and flicked the ball past the on-rushing Matt Duke to make it 2-1 with 82 minutes played. However, it was the young Irishman who scored Bradford’s third goal. Once again, Gary Jones put in a fine delivery from a corner and McHugh managed to elude his marker to guide his header exquisitely past his fellow countryman, Shay Given. 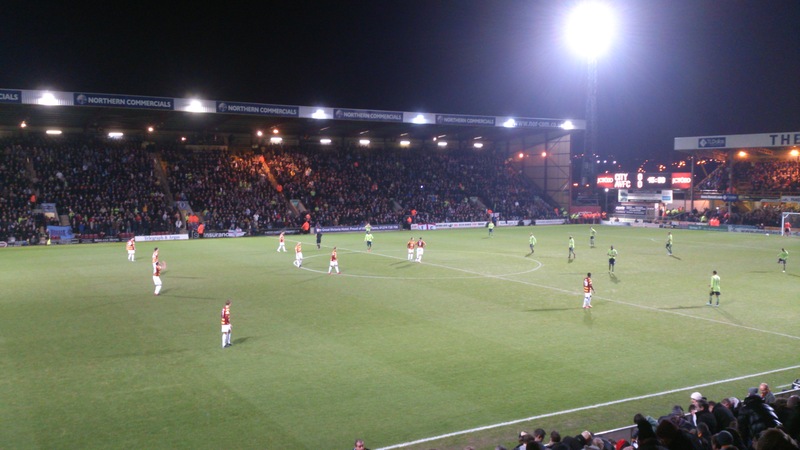 Bradford’s amazing run in the League Cup this season has reignited the romanticism that has long been associated with the cup competitions in England. Throughout the history of football, the neutral fan has begged for the underdog to topple the favourites and Bradford City have fulfilled that age old desire for the ‘David Vs Goliath’ match up this season. The lowly, League Two side have put together an unbelievable run of results that has seen them take the scalps of several high profile clubs to reach the semi finals. Premier League giants Arsenal & Wigan Athletic are amongst the biggest teams that Bradford have taken out of the competition, along with Watford, Burton Albion and Notts County.